Kailey Coffey (23) drives toward the basket during the game against Alderson Broaddus. Coffey had 6 pints on the game. 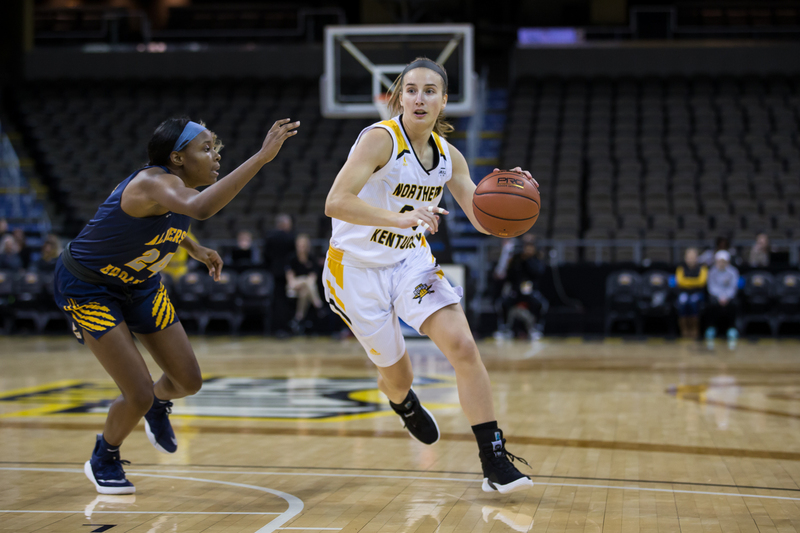 The NKU women’s basketball team traveled north to the Kent State Classic in Kent, Ohio over the weekend and came home with a pair of tough losses. The Norse opened play on Saturday evening with a heartbreaking defeat (62-61) to Kent State, then fell to the University of Akron (77-60) on Sunday afternoon. Sophomore forward Grayson Rose totaled 17 points and 15 rebounds, while Emmy Souder combined for 16 points and 7 rebounds to lead the Norse over the two-game stretch. With the losses, the Norse drop to 1-2 on the season while the Flashes improve to 2-2 and the Zips remain unbeaten at 3-0. The Norse will be back in action on Wednesday, Nov. 21 as they host the reigning Ohio Valley Conference champions, Belmont University. Tipoff is scheduled for 6:00 p.m. and will be broadcasted on ESPN+. After being down by seven early in the final period, the Norse rallied to go ahead by three, following a 13-3 run at the 3:46 mark. Though both squads would knot the score three times in the final few minutes, senior guard Alexa Golden nailed a jumper with 56.5 to play, followed by a pair of crucial stops and a pair of free-throws by Ali Poole to ice the game. Ally Niece would sink a three with 0.6 seconds remaining, but it was too little, too late as the Flashes ran the clock out for the victory. Freshman Asiah Dingle led the Flashes with 15 points, four assists and four steals, while Megan Carter added 14 points. Though the Norse shot slightly below (43.1 percent) the Flashes (43.5 percent), the Norse went 6-of-19 from beyond the arc and outrebounded the Flashes 35-23. Rose posted a career-high with 16 points and was just shy of a double-double with nine rebounds. Niece scored all 12 of her points in the second half while Taylor Clos chipped in 11 points and a pair of assists. Saturdays woes carried over into Sunday as the Norse got off to a dismal start and allowed the Zips to sprint out to an 11-0 lead in the first 4:24 of the contest. 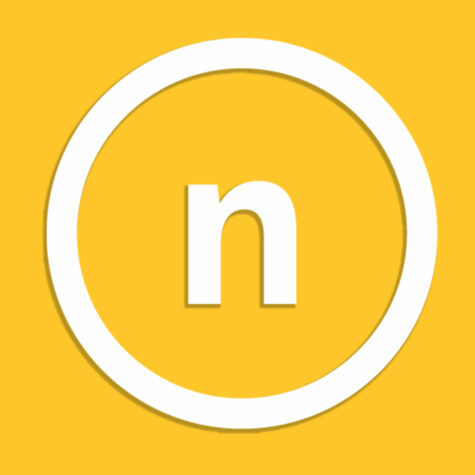 The Norse answered back with a run of their own (8-2) to end the first quarter down by four. The comeback wouldn’t last long as the Zips came out firing on all cylinders in the second period and scored 16 unanswered points to take the lead 32-11. Following the halftime break, the Norse stepped their game up and went toe-to-toe with the Zips by crashing the boards (16 rebounds) and matching them point-for-point (17-17) to end the third period down 56-38. Despite the Norse taking the plus one-point differential (21-20) in the final period of play, the lead never dropped below 15 points as the Zips closed the contest 77-60. The Zips shot an efficient 50.8 percent from the field and were led by redshirt senior Megan Sefcik, who paced the offense with 22 points, while Shaunay Edmonds scored a season-high 12 points and nine assists. Souder came off the bench to score a career-high 16 points and six rebounds for the Norse, while Kennedy Archer chipped in eight points and three assists. Though the Zips held the edge in the paint (28-26), the Norse outrebounded the Zips by six (40-34) and the bench outscored the reserves by 19 (41-22).